Summer vacation may be coming to a close but that doesn’t mean your wardrobe needs to undergo a drastic shift. In fact, August and September often bring about some of the warmest days of the year. Having spent the majority of this past weekend sprawled out at the beach, sipping cold beverages, I can’t imagine that these temperatures will be going away anytime soon and that means, like it or not, you have to find ways to stretch out your summery attire for a bit longer. I personally love the breezy, colorful clothing of this season, but I know that around this time of year, there are a lot of people who are antsy to switch over to booties, scarfs, and plaids. For all of you eager beavers out there, I have found that adding a simple staple, like this jean vest from the Gap, helps to quickly refresh your tired summer look. Not to mention, the vest adds a light layer of warmth for chillier days. Providing each outfit with an extra bit of dimension, there are so many ways to integrate a jean vest into your wardrobe. I raided my closet to come up with three different looks for this vest, but as it is such a versatile piece, the possibilities were really endless. All of the outfits I chose are casual and comfortable and with the help of the vest, they’ve been given a bit of a facelift. For this first look, I paired a printed, flowy maxi dress with the fitted denim vest. While this look is hardly a new fashion trend, it’s always great to be reminded of classic pairings that work well together. 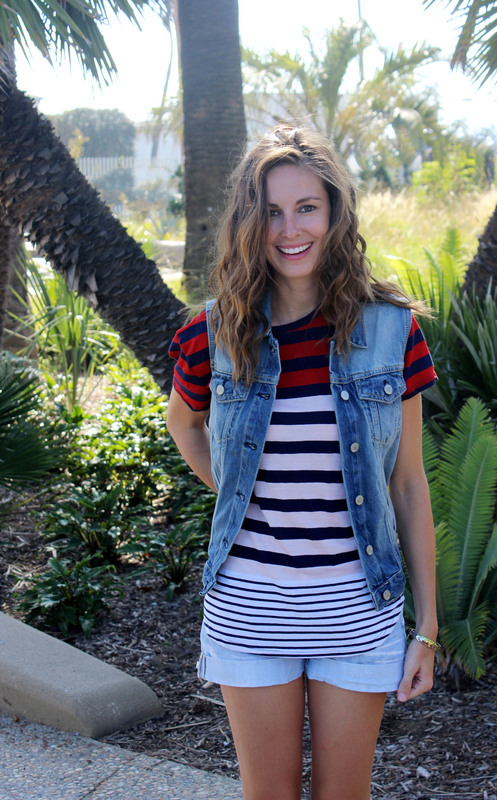 I paired a striped tee with a high-waisted skirt and was able to tie the entire look together with the jean vest. In this case, the denim layer is essential to balance out the rest of the look. I’ve found that a great way to create fresh, new, stylish outfits is to mix prints with other prints, which is what I played around with here. Matching the long sleeve stripes with the bright florally skirt also creates for a great outfit for transitioning from the summer to the fall. This fun and simple denim look is improved with the addition of more denim! Once a fashion faux pas, I love playing around with mixing denims. The key is the pair different weight and washes, and keeping accessories simple. I added some stripes to this look as well but I feel it adds a nice balance.